45º miter] use an out-down-back motion with the rail lock knob loosened. the risk of workpiece damage and personal injury. saw to slide along its rails. from left or right. Make the cut as described above. length, always place the longer side against the fence (Fig. 12). angle has been set, tighten the bevel clamp handle firmly. knob several turns and slide the fence out. the quality of the cut. place. Always let the blade come to a full stop before raising arm. through the tape and carefully remove tape when finished. blades for your saw and select the one that best fits your needs (Page 5). cutting area. Place hands no closer than 6" (152.4 mm) from the blade. NOT CROSS HANDS, AS SHOWN IN FIGURE 13B. surface. Personal injury may occur. is not clamped on the edge of the base of the saw. (6") from the blade, a clamp or other fixture must be used. 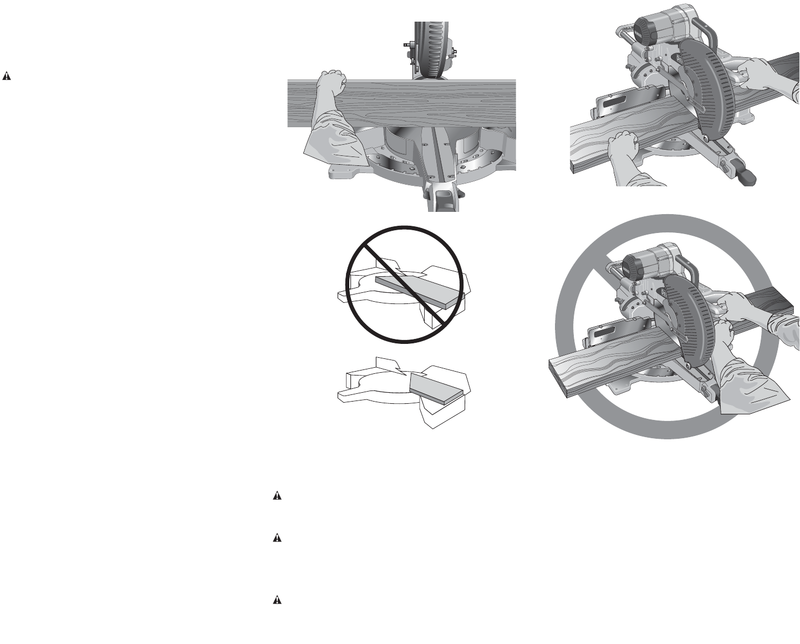 For best results use the DW7082 clamp made for use with your saw. the DW7082 contact your local retailer or DEWALT service center. cut. The left or right fence will slide from side to side to aid in clamping.